OTTAWA — Glandorf Boy Scout Troop 229 members Parker Schnipke and Cael Hoehn completed concession stand and archway improvements at Memorial Park in Ottawa as part of projects to become Eagle Scouts. Schnipke and Hoehn, both 15 and freshmen at Ottawa-Glandorf High School, have know each other since they were in the same Cub Scout troop in kindergarten. They are currently Life Scouts applying to become Eagle Scouts. Their projects will be reviewed and approved by a Scouting board and they will become Eagle Scouts. 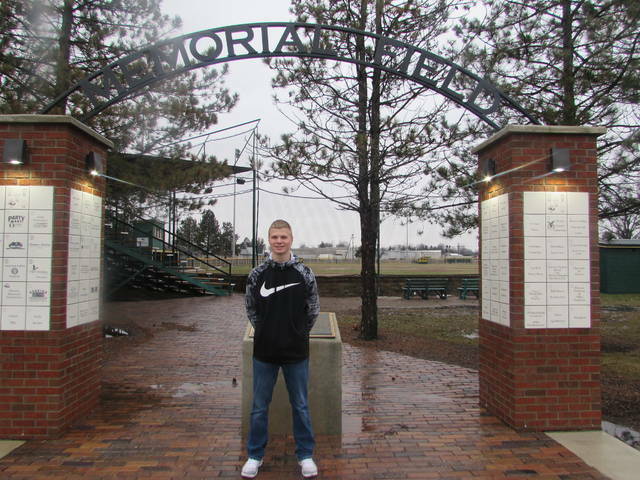 Schnipke completed his Eagle Scout Service Project by working with volunteers to spruce up the entrance to the Memorial Field installing two 9-foot pillars made of brick and helped set an arch on top of the two pillars that said “Memorial Field.” He also made a pathway using old 3rd Street paver bricks and landscaped around the new entrance. “I think this project makes the entrance to the park look nice. I learned about leadership and working with others,” Schnipke said. He said the previous entrance to the park was in bad shape with just the Larry Cox memorial and a concrete slab around it that deteriorated and cracked. K&L Ready-Mix of Ottawa donated bricks for the pillars for the project and the cement. Verhoff Welding made the arch letters, Leipsic Precision Laser cut the letters for the arch and Schnipke’s brother, Connor, welded the archway and Huggins Auto Sales sanded and painted the archway for free. He started the project last spring and completed it last summer. It was dedicated last June. “I hope the park stays looking nice and people can come enjoy it because it’s a nice park and baseball diamond,” Schnipke said. Hoehn’s project was making repairs to the concession stand at Memorial Park. “There were holes in the concession stand and the flooring was carpet that was dirty,” Hoehn said. The ceiling also was falling down. Ultimate RV in Delphos donated the flooring that is recycled rubber that was laid. Glandorf Lumber donated two sheets of drywall and screws for the concession stand’s new roof. LED lighting was installed to replace fluorescent lights. He and volunteers moved the refrigerators, grills and coffee pots to a storage unit while the work was being done. The project began last August and was completed last October and will be dedicated this baseball season. “I learned how to weld steel brackets to hold Gatorade and pop cases,” Hoehn said. 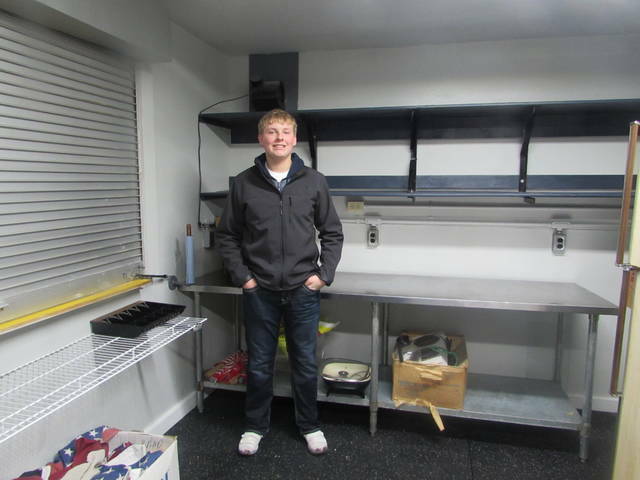 “I learned about leadership skills in calling companies to help with the project and having volunteers help.” He also installed a shelf to organize items inside the concession stand. The Eagles and American Legion donated funds to purchase a table used to prepare food in the concession stand. Dr. Ron Black served as the task manager for both projects. Black was a Boy Scout himself growing up. “Scouting builds leadership and makes them think and gives them life challenges they have to meet,” Black said. He said the projects taught the boys about carpentry, brick laying, welding and electrical skills.